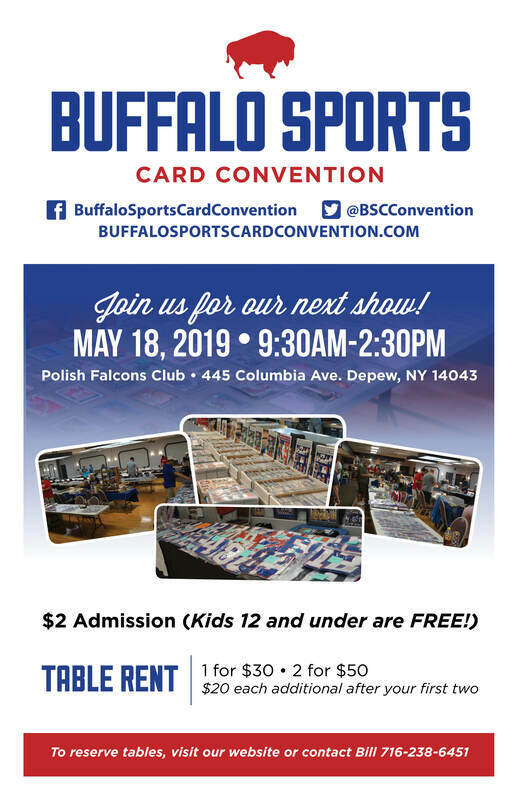 We invite you to check in on our up and coming Sports Cards shows in Buffalo, NY. Originated in 2017, BSCC was created to help bring back the hobby in our area. Every year we try to have about 6 shows to bring nothing but the best in sports cards and memorabilia this area has to offer! We encourage you to give us a shot and see what we have to offer! Please give us likes and follows on our social media sites which are linked below. Also if you have any interest in setting up, whether it's your first time or you are a vendor from way back, contact us and we will get you set up for the next show! Thanks for visiting and we are looking forward to you helping us become the best sports card and memorabilia show in WNY! Our fourth show at Polish Falcons and it just keeps getting better! Thank you to all the vendors and customers who came out to our March show and made it a huge success! We are thrilled and can't wait for the next show on May 18th. We look forward to seeing you there!! To be a part of our show, check our the Admission/Vendors page! THE BEST CARD SHOW IN WNY!